Springbank Farm Lodges Self-cateringSpacious log cabins in tranquil farm setting with spectacular open views. Wheelchair friendly with ample parking. On-farm experience yet close to amenities, the beach, historic towns of Whitehaven and Egremont and the mystical Western Lakes. St Bees village 1 mile, start of the Coast-to-Coast, pubs, restaurants, shops, railway station, beach, golf. Leisure facilities, theatre, historic Whitehaven and Egremont less than 5 miles. Nearest lake Ennerdale 10 miles. Children welcome from any age. 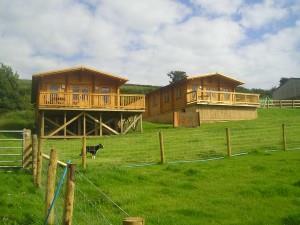 Springbank Farm Lodges offers weekly bookings starting on Saturday and sometimes short breaks. Leave M6 jct 40, Penrith, turn onto A66, Keswick to Workington. Continue on A66 until roundabout, forst left A595, Whitehaven. Follow A595, bypass Whitehaven town centre. Take first right after West Lakes Science Park. Signpost St Bees, unsuitable for heavy goods vehicles and caravan. Travel 1 mile, Springbank Lodges are on your right after Low Walton Farm. Complimentary pick up at St Bees railway station for walkers and cyclists. Lovely countryside setting, comfortable accommodation & excellent value for money. Family of 4 - children are 10 & 12. The children loved collecting fresh eggs each morning & feeding the donkeys. We were blessed with good weather & the views from the balcony are stunning. Close to Scafell & Wast water. We didn’t get the chance to explore the surrounding area as we were there for a karting event but plan to come again & stay longer next time. Glad you enjoyed your stay. We are always available if you need anything and aim provide a 5* service! If there is anything we could do to improve this, please let us know. We hope to see you again.